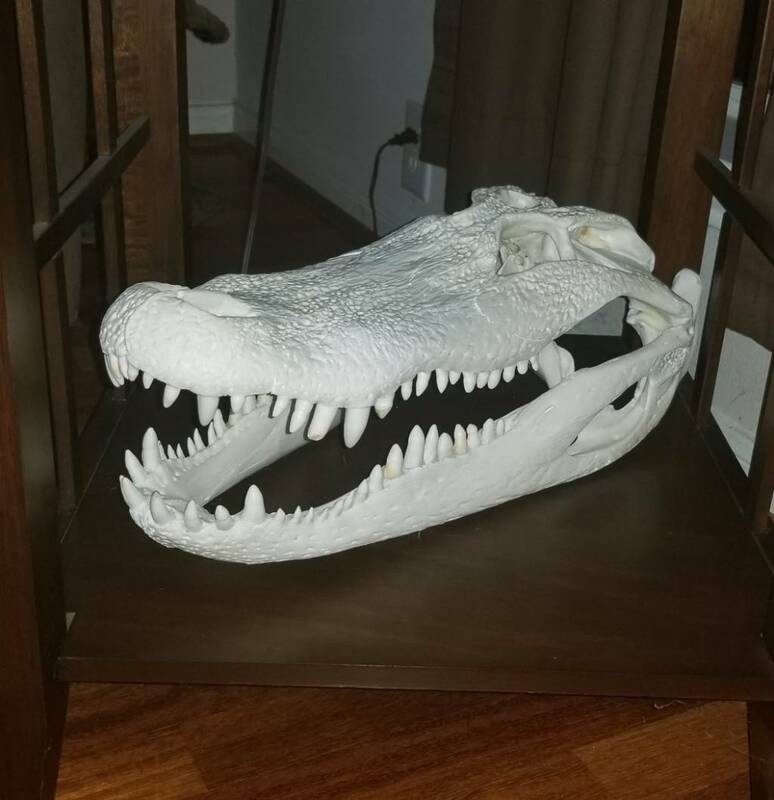 I need alligator mount ideas. I am not against a full body mount, but looking at other possible options. I am leaning toward full body, table top (half body), or a skull mount. 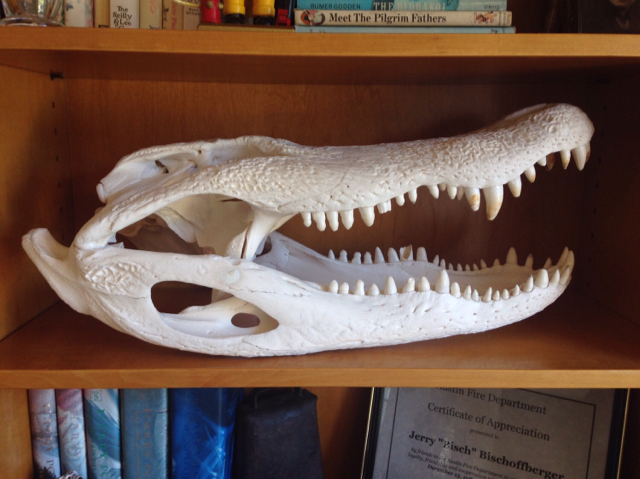 I just don't want it to look tacky, and I like the look of an alligator skull to put on my desk. However, I feel like if I end up killing one with my bow, I should mount the entire **** thing! These are basically my options unless y’all can give me a better idea. 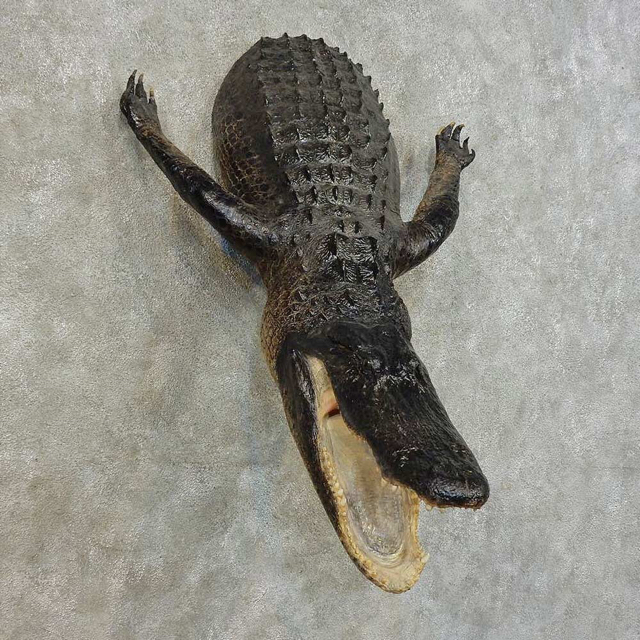 Unless it is a state record I would never full body mount an alligator LOL. Get the skull euro'd, not a tacky gas station freeze dried head. That one that BPhillips has is bad arse but you need the right room for it. I just went on a hunt and looked at them before the hunt and my plan was a rug with the right one. I have not seen the half mount referenced but the skull mount is a must. Couple 5-6’ on my hunt nothing that I was interested in mounting. I skinned one of mine had have it on the wall. It is 11'7" long. I have the skull on the shelf right below it. I'll have to go with this for the lady. Since I doubt the pic is showing, here is a link. And Euro mount the skull. Last edited by icetrauma; 09-13-2018 at 12:14 PM. definitely the head in the box! Can you be a little more specific, CB ? 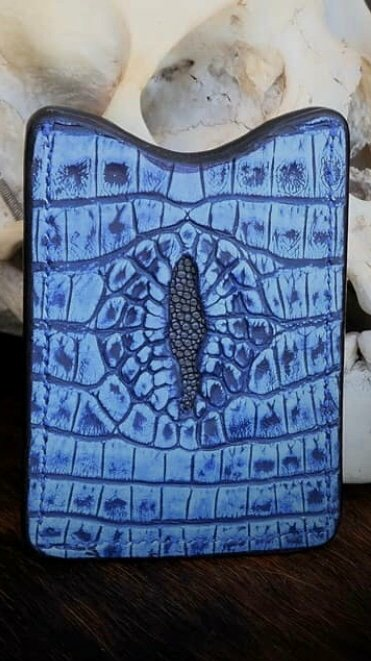 I've tried to search for it, But there seem to be thousands of DocMay references, but zero DocMay alligator search references. I'd really like to see it. I've got a 10 footer at the taxidermist right now. Just looking for ideas. Been putting in for the draw hunts for a while now chomping at the bit to get drawn one day, and have been debating this same topic of what kind of mount would be the best. I personally think the skull mount is the best looking as I feel quality good looking skin mounts are hard to find, or a taxi who can make it look real. Same here. I looked, but got nada. Euro Skull mount is my favorite. 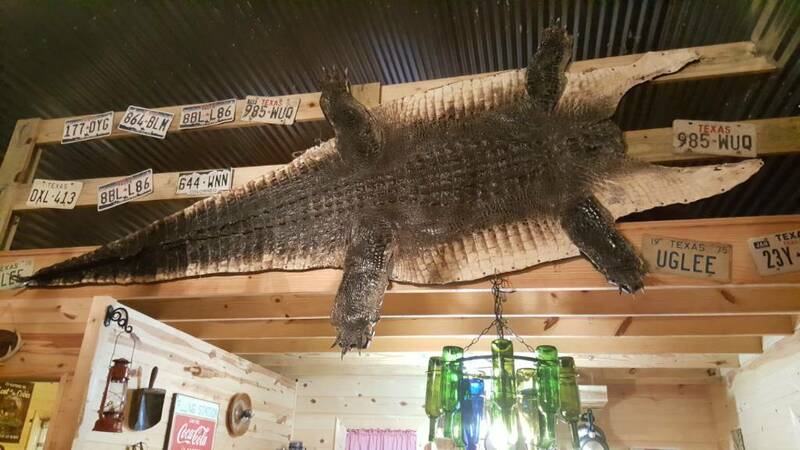 Have you priced a lifesize alligator mount in Texas? 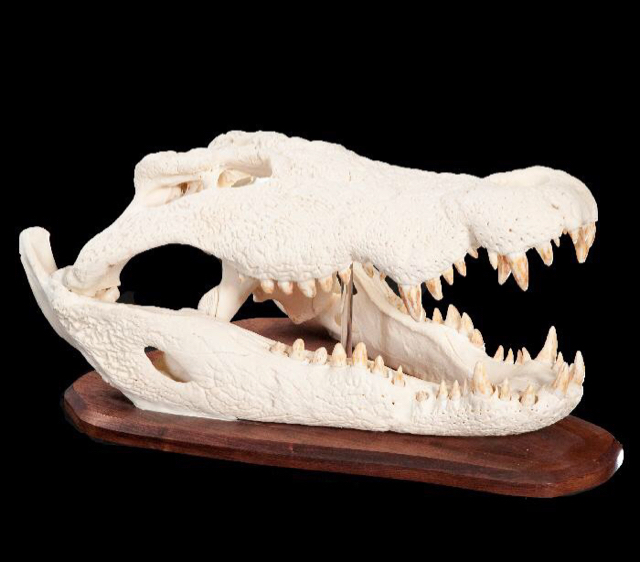 The cheaper taxidermy of alligators seems to be done in Florida although shipping the hide will add additional costs. 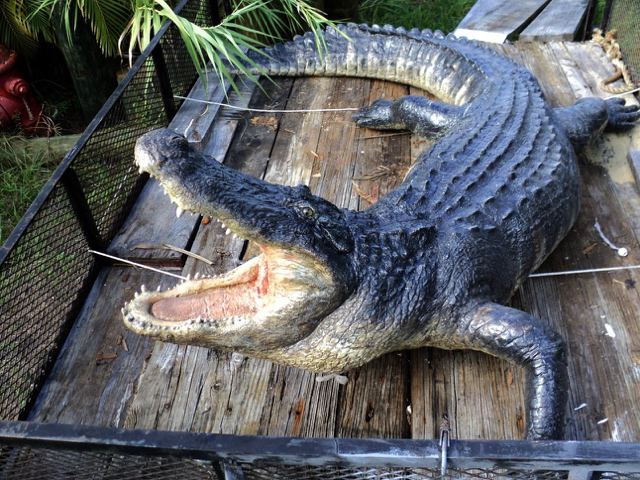 Tanning an alligator is very costly compared to fur bearers. I'd get one mounted with a whiskey jug or like an old beer can or something beside it. Almost like it's swimming in the swamp and someone had sunk some beer cans or some random junk to the bottom. 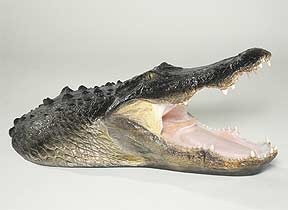 It'd be cool to get it mounted with a fake arm or something hanging out of its mouth. Last edited by okrattler; 09-13-2018 at 02:07 PM. I'd do the skull, then have the skin garment tanned, make yourself a pair of boots and a bikini for Lindsey! What he said if not full body. Half body looks like you couldn't afford the other half. Tribute to Amos Moses. Get an arm in his mouth! That's what I did. Getting some loafers, accent pieces on wallets, belt, etc. I skinned mine on my own, following the instructions on American Tanning's website. They did a phenomenal job, I believe I was in it around $500. Dang Bobby. Yours looks pretty awesome too. That is what I was planning on doing, but was afraid of the space it would take up. I could make it happen though. I'd go skull mount, and a couple of wallets or a briefcase/handbag if it was big enough. I got my skull euroed, the belly hide tanned for leather products and the backstrap tanned to hang and display. I'll snap pictures for you later if interested. What'd you have the belly made into? Let's see some pics. Nothing yet, planning on boots and a wallet maybe a belt too if there is enough. 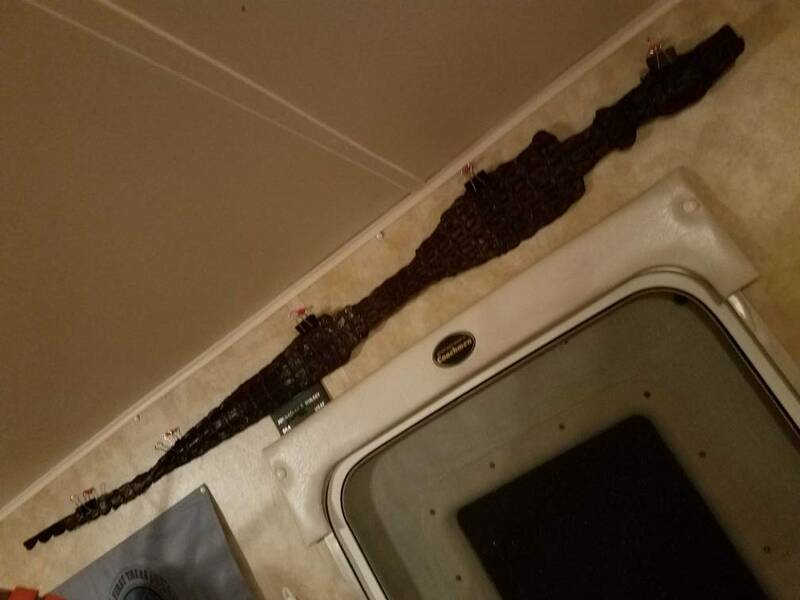 But that's the backstrap hanging in my trailer. But that's the backstrap hornback hanging in my trailer. The backstrap is that good part of meat, on a deer, that you wished the whole deer was made of! Nobody's ever accused me of being very smart haha. Thanks for the correction, was just repeating what the redneck in Florida called it. I was just a little disappointed when I didn't see a tanned chunk of meat hanging on your wall! One of the coolest euro mounts I’ve ever had done!!! I would get a euro skull mount and a pair of boots made if I ever killed one! A lizzard mount is just something else to collect dust. From the back because they are really heavy to roll over; just make sure you lift the tail over your shoulder.... oh wait a minute I think I misunderstood the question. This is what I did with my 10'8". I was gonna do this, but Janek Alligators said I took to long to pick up after I called them and they said it wasn’t ready to pick up. Now I have a gas station head at home. I like the euro mounts the most. Then have some stuff made with the skin. I always thought it would be awesome to have some alligator boots made from an alligator I shot, and some shark skin from a shark I caught. I was like, "What in the.....Oh business card holder.....Awww what the....."
Now how ya'll killing yours? I got back from Georgia a few weeks ago. 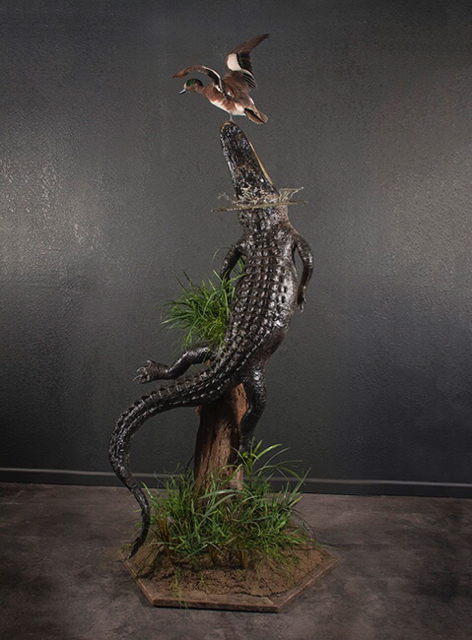 Nailing a 7'4" gator. Had to have a hook in it before you shoot it. NO hanging hooks with bait on them. Snag drag bang. That is what we did and the skull on my gator was shattered after shooting. There went the Euro. The jelly rolls at top of tail are what can be called gator backstraps. Most tender. Here is how we have done a few or ours. The one on the wall is a rug type with the back filled. The one on the couch is soft tanned back skin. And of course, the European skull mount. We also have skin mounted heads, but I didn't take a pic of those.